Slovenia is a country in Central Europe that touchs the Alps and bordering the Mediterranean. 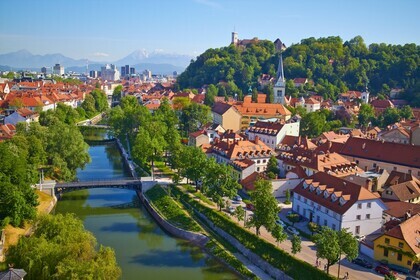 The capital and largest city of Slovenia is Ljubljana. It covers an area of 20,273 square kilometres and has a population of 2.06 million. The highest point of Slovenia is the 2,864 metre (9,396 ft) high Mount Triglav. The majority of the population speaks Slovene, which is also the country's official language. Other local official languages are Hungarian and Italian.